This unique hybrid of Berlioz’s opera, spoken Shakespearean dialogue and music from other Berlioz works was created with ACT Theatre artistic director John Langs and Seattle Symphony music director Ludovic Morlot. It’s action-packed and nobly sung but also has some problems. Hector Berlioz’s last opera, “Beatrice and Benedict,” has been performed since 1862 — but Seattle Opera audiences heard a world premiere of the work last weekend. The concept was created by a partnership that included Seattle Opera’s general director Aidan Lang, ACT Theatre artistic director John Langs and Seattle Symphony music director Ludovic Morlot. It’s an imaginative contribution to the current Seattle Celebrates Shakespeare festival (with dozens of local companies saluting the Bard in music, theater, dance and film). Fast-paced, action-packed and nobly sung, “Beatrice and Benedict” also is a production with some problems. The score is unevenly inspired; it’s chaotic and short on memorable melodies. The libretto, taken from Shakespeare and translated into French, has been translated back into English again, with additional lengthy spoken dialogues and monologues that weren’t in Berlioz’s opera. The result is a hybrid of opera and play. The performers are amplified for the spoken (Shakespearean) dialogues, some of which occur at a speed that make them almost unintelligible despite the discreet microphones. The singing is unamplified, as is usual in opera, and the text is projected in the supertitles above the stage; even though it’s sung in English, the titles are helpful. The interpolated spoken dialogues add both context and complexity to the Berlioz original, which didn’t include the crucial Shakespearean plot twist that nearly derails the wedding of two major characters. Constantly on the move, this production has the cast — attired in Deborah Trout’s spectacularly colorful costumes — leaping up and down stairs on Matthew Smucker’s versatile, multilevel set. 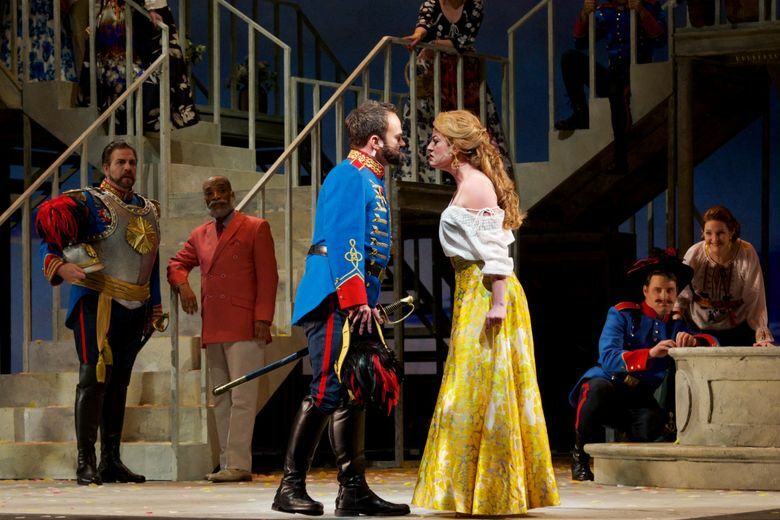 Cheers to the versatile and active Seattle Opera Chorus (John Keene, chorusmaster) and to choreographer Helen Heaslip. The lighting, by Connie Yun, was highly varied and occasionally disconcerting, as when the stage was suddenly bathed in purple to accompany a mournful aria. 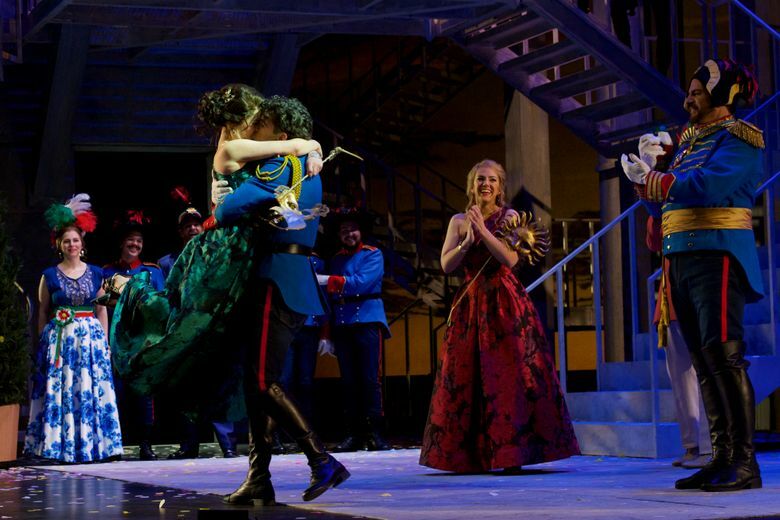 On Saturday night, the impetuous and feisty title roles were taken by Daniela Mack and Alek Shrader — both high-energy singers and compelling actors who were completely believable as opponents and as lovers. Sunday’s show had the excellent and well-matched Hanna Hipp and Andrew Owens, respectively. The real scene-stealers here, however, were the young lovers whose wedding is interrupted. Shelly Traverse, who stepped into the role of Hero on short notice as a substitute for indisposed soprano Laura Tatulescu, charmed the audience with her voice and stage presence, both lovely and unaffected. 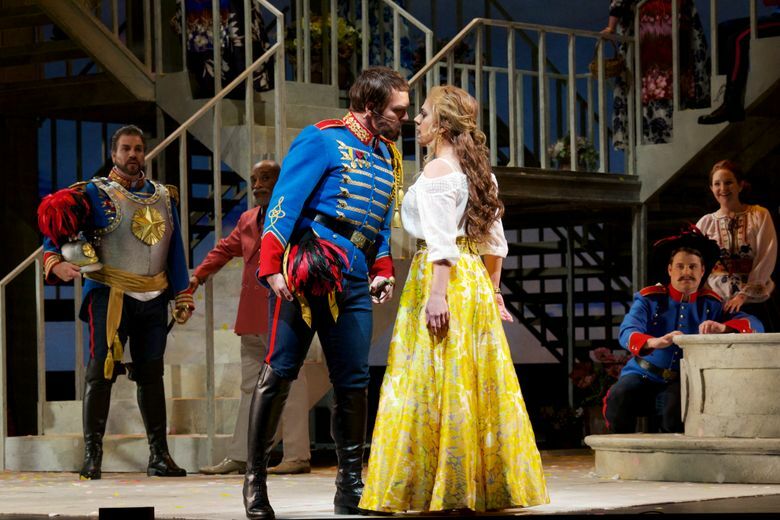 Craig Verm, as her would-be husband Claudio, sang beautifully and was a compelling actor. Marvin Grays was an effective Leonato; Daniel Sumegi a powerful Don Pedro; and Brandon O’Neill and Avery Clark were the villains you love to hate. Kevin Burdette’s over-the-top Somarone was consistently hilarious. Christine Marie Brown, Chip Sherman and Avery Amereau all shone in smaller roles. Seattle Symphony music director Morlot, a well-known exponent of Berlioz’s music, stitched up this varied musical fabric into a persuasive whole, giving the singers plenty of expressive opportunities while never allowing the pace to flag. Berlioz described his own opera as “A caprice written with the point of a needle”; Morlot wielded that precise “needle” as his baton. “Beatrice and Benedict,” by Hector Berlioz. Seattle Opera production with Ludovic Morlot conducting and staging by John Langs. Saturday evening and Sunday afternoon, Feb. 24-25; continues through March 10. McCaw Hall, 321 Mercer St., Seattle; $25-$308 (206-389-7676 or seattleopera.org). Melinda Bargreen, who has reviewed music for The Seattle Times since 1977, is the author of two books about the region’s musical scene; she also writes for several publications. She can be reached at mbargreen@gmail.com. This report is supported, in part, by the Rubin Institute for Music Criticism, San Francisco Conservatory of Music, and the Ann and Gordon Getty Foundation.